The Boss ODB-3 Bass OverDrive pedal gives your bass sound some fantastic crunchy overdrive tones. Chest Rattling OverDrive Designed specific.. The Boss ODB-3 Bass OverDrive pedal gives your bass sound some fantastic crunchy overdrive tones. Designed specifically for bass guitar, the Boss ODB-3 Bass OverDrive pedal allows you to add some serious crunch to your tone. 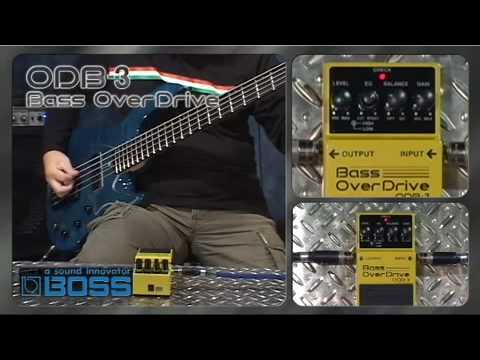 With a great range of controls onboard, the Boss ODB-3 Bass OverDrive pedal provides a wide array of sounds suitable for all sorts of playing styles and genres. From a slight crunch to a full-on, chest rattling distortion suitable for pop and blues all the way to hard rock and thresh metal, the ODB-3 Bass OverDrive pedal has got you covered. One of the many great features of this pedal is the concentric EQ knob. This works as a two-band equaliser for the distortion so you can get the exact overdrive sound you’re looking for. The lower knob allows you to either boost or cut the lower frequencies while the knob on top allows you to do the same for the higher frequencies so you can really sculpt your sound. A balance knob is available which allows you to set the mix between the dry, direct signal from your bass and the overdrive effect from the ODB-3 Bass OverDrive pedal. Specially designed for bass, it handles the low frequency range of your bass guitar perfectly and with the addition of the two-band overdrive EQ, you get some incredible sounds. As with all Boss compact pedals, the ODB-3 Bass OverDrive pedal comes in a solidly built metal chassis that’ll withstand all the rigours of the road. Also, being nice and compact it’s very pedalboard friendly! Buy the Boss ODB-3 Bass OverDrive pedal now and add a huge range of high-quality overdrive sounds to your bass tone, whether you’re performing live or recording in the studio. Weight: 420 g, 0 lbs, 15 oz.